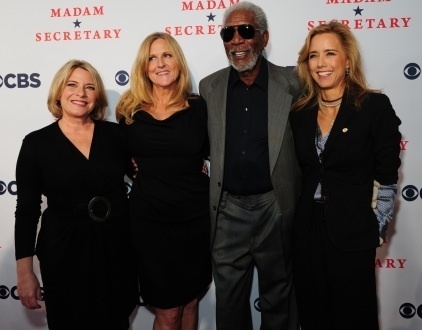 (L-R) Barbara Hall, executive producer of "Madam Secretary," Lori McCreary, executive producer, and cast members Morgan Freeman and Téa Leoni. Tea Leoni stars in Barbara Hall's "Madam Secretary"
Zeljko Ivanek and Tea Leoni co-star in Barbara Hall's "Madam Secretary"
Tea Leoni and Tim Daly star in Barbara Hall's "Madam Secretary"
Barbara Hall has created multiple TV shows that approach a variety of topics: while "Judging Amy" delved into the system of juvenile courts, "Joan of Arcadia" was a contemporary take on the classic Joan of Arc story. 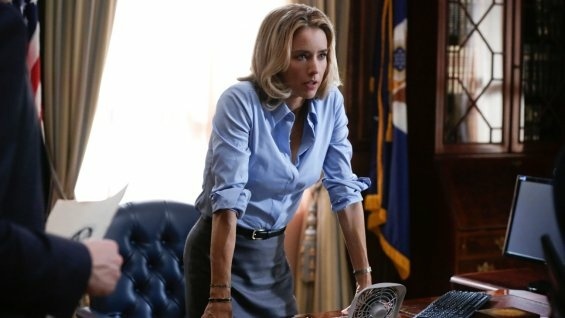 Her newest show is "Madam Secretary," a political drama in which Tea Leoni stars as a fictional Secretary of State. Hall recently stopped by The Frame studio, where she talked with host John Horn about her creative process, her experiences as a woman in Hollywood, and the inspirations for "Madam Secretary," which range from Madeleine Albright's granddaughter to Bruce Springsteen. "I did actually have the good fortune to meet with Secretary Albright and talk to her about what that was like for her, and she had one story that she told me that I thought was really interesting, which is that one of her granddaughters said to her, 'What’s the big deal about Grandma Maddy being Secretary of State? All the Secretaries of State are women.' And I loved that she shared that with me because it’s a kind of perspective that we’re going for. Of course, right now, we’re adjusting to the idea that [Leoni's character] Elizabeth McCord will be the fourth female Secretary of State, but of course we want all of it to be one day that somebody’s kid will say, 'What’s the big deal about a female president?'" "Well, I really like the fish-out-of-water; the reluctant hero is probably a common theme of mine. It’s certainly something that I set up in 'Madam Secretary.' It’s important for me to bring her in from the outside. And then women in a man’s world is something that I end up exploring a lot and something that I end up living a lot, so I think that finds its way into my work. "I don’t think it’s as simple as that, for sure. What I really believe is that when you set out to do something as difficult as creating a television show and doing the work or trying to find an audience and keep it on the air, it really had better be something that you have a strong connection to — much stronger than just wanting to tell a story. I think the best shows do have a connection to something in the writer’s journey that he or she is determined to express. And for me, just because I’ve been able to live this very different kind of life, I really feel close to that idea of coming into this world and trying to make your mark in it — and doing that as a woman and as a mother is a very big part of my story." "When I first started I was the female voice and you get a lot of jobs early on. [People in charge thought] Well, I guess we should have a woman in the room on this. And, of course, that changes. The industry has changed a lot and there are a lot of female writers. I find that the range gets more narrow as you go up and so that there are less female showrunners than there are female writers. So, it’s something that I really feel I got in on the ground floor as it was changing, and now I’m a part of the rest of it changing. 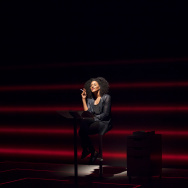 So, it really was a journey for me the way I hope we can experience it for [Leoni's character] because it isn’t just about being a woman. It’s a little bit about being an outsider, too." "I think the primary way he changed my life was, honestly, it’s something as simple as the fact that he was somebody who came from nowhere and then went on to express himself through his chosen art form and then had everything that he imagined himself having in terms of expression and breaking out of his world. And I was someone who came from a very small town, who didn’t have a leg up on anything. 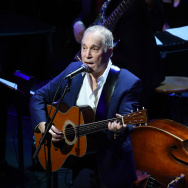 In fact, I couldn’t see the poetry of where I came from and I figured that if Bruce could make poetry out of New Jersey, I could make poetry out of a small town in Southern Virginia." Are 'Gotham' and other comic book TV shows just a fad?